Murder, He Says. Paramount Pictures 1945. This was a suggestion from a Facebook friend. All I needed was Fred MacMurray or “murder comedy”, but this appears to be both. 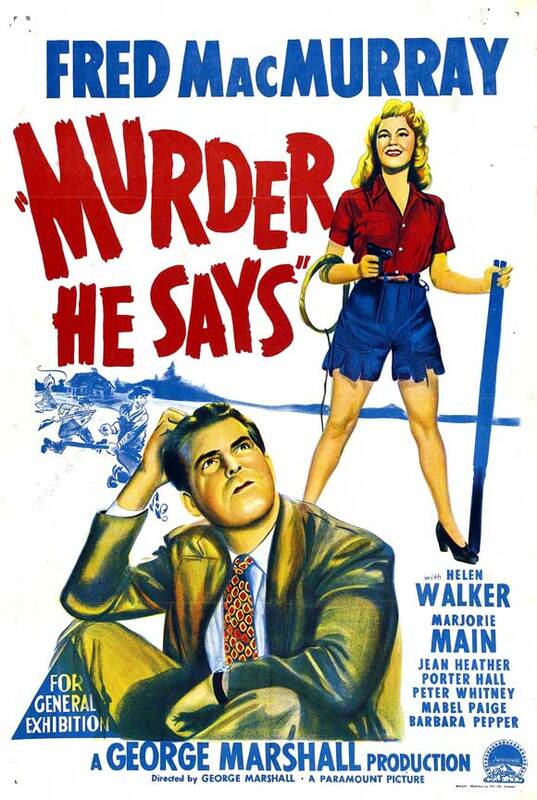 I actually wasn’t sure when I decided to do this if it was a comedy or a thriller, but I was fairly certain MacMurray never played against type (0r at least in anything dark) in anything but Double Indemnity. So I was fairly certain it’ll be a good time. I’m a little surprised I don’t already have a tag for Fred MacMurray. I’ve invoked The Happiest Millionaire in a few other blog posts, and he actually appeared via archive footage in Dead Men Don’t Wear Plaid, but in too minor a role to merit getting tagged as a star, and also I didn’t like what the movie did with the clips from Double Indemnity. Thanks to classic Disney films like Happiest Millionaire and The Absent-Minded Professor, as well as the impact Double Indemnity left on me as a young film student, I’ve always felt like MacMurray has had a minor presence here, but this is somehow the first time he’s starred in a review. Pollster Pete Marshall comes to a small rural town to investigate the disappearance of a colleague and is quickly directed toward the Fleagle family’s property, and in turn, is nearly killed by the hillbilly Fleagles as “another snooper”. The Fleagles, Mamie, her twin idiot sons Mert and Bert, and Mr. Johnson (Mamie’s bookish third husband) are very keen that he get out until Grandma Fleagle sees him, and they decide instead to force Pete to pose as “Bonnie’s sweetheart” to Grandma. Grandma confides to Pete that she’s been poisoned in some manner that causes her to glow in the dark so that Mamie’s family (a different branch of Fleagles) could get their hands on the money stolen by Ollie and Bonnie Fleagle’s gang which Grandma hid while Ollie went to the gallows and Bonnie rotted in jail. Grandma doesn’t tell Pete where the money is, just sings him a nonsense song and tells him to pass the message on to Bonnie, who will understand it, then she dies. Of course, Mamie’s family doesn’t believe what Pete says Grandma confided to him, and are just about to beat it out of him when Bonnie shows up. Except once Pete explains his story to her alone, she confesses to him that she’s not Bonnie, she’s Claire, the daughter of a bank employee falsely implicated by Ollie and Bonnie’s gang looking to find the money and somehow prove her father’s innocence with it. And she insists Pete help her. Their dim hope seems to rest with Mamie’s innocent young daughter Elany who, who knows Grandma’s nonsense song and little else. This suffers from play pacing, yet isn’t based on a play. It’s an inciting action killing time with slapstick while waiting for the third act. I thought when Grandma glowed and Bonnie wasn’t Bonnie that the story was finally getting going, but then it went back to setting up showstopper physical comedy sequences more than advancing the plot. Some of them were a lot of fun, like the first time Pete tries to bluff an escape. Others were just yet another bumbling chase. It can’t just be that slapstick pacing for that day and age doesn’t translate anymore, since movies by the Three Stooges are still enjoyed today. This is only an hour and forty-five minutes, but it felt like it could have been at least half an hour leaner. Maybe I was a little off my game, but I was all ready to commend the movie for casting twins of similar comedic talent. When I went to take note of the cast, I was surprised to learn that Mert and Bert were one actor’s dual role. Reviewing some scenes more closely, I can see that while they do appear on screen together a lot, usually one of them has their back to the camera. However, those scenes, and even the shots where they do both show their faces, don’t feel nearly as carefully staged as most doubling shots are. I also didn’t expect the movie to have effects, and by the time people started glowing I’d already convinced myself Mert and Bert were played by actual twins. Elany. Just, Elany. Elany is the most difficult part of the movie. Mert and Bert are inbred hillbilly morons, but Elany is autistic or something like it. Material more in line with the vocabulary of the time says “dimwitted” and “lunatic”, but Jean Heather’s performance cannot be read any other way than that Elany is mentally handicapped. She’s never the punchline, but she’s not really handled with respect either. She drifts in and out of scenes, says something tantalizingly close to helpful, and reflexively sings Grandma’s nursery verse. That would just be problematic, but then somebody without Pete and Claire’s scruples realizes she might know something, and the result is not something that belongs in light entertainment. Claire inadvertently rescues her, but doesn’t actually do anything to help and just starts questioning her again, then Elany runs off and Claire and Pete go on to try to make a run for it, oblivious to Elany getting back into danger with the rest of the family. In the end, Elany plays her part in getting her own justice, but it’s so accidental that it seems meaningless, and Pete and Claire’s reaction to this is to actually shrug and say “oh, I forgot about her”, without a shred of self-awareness apparent. The concept had so many things going for it. Fred MacMurray plays a guy in over his head and a is lot of fun to watch as ever. A romping murder mystery slapstick farce inspired by Bonnie and Clyde with greedy hillbillies? Sure sounds like a hoot. But the pacing has not aged well, and just… Elany. It was a different time, and this isn’t trying to be Of Mice and Men, but… ugh. The handling of Elany just casts a pallor over a movie that turned out to be a struggle to get invested in anyway. This movie could and should have been so much better.